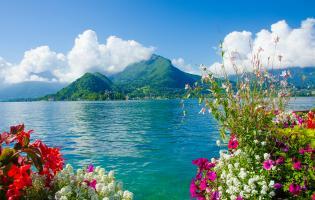 Your holidays at a 4-star campground between the mountains and Lake Annecy. Need a break to recharge your batteries? Camping L’Idéal welcomes you to an extraordinary natural environment at the foot of Bauges Massif, on the shores of Lake Annecy. Our campsite, which melds perfectly into its environment, was designed to offer dream holidays to people looking to explore the Haute-Savoie and reconnect with nature as a family, a couple or with friends. Whether you are looking for an outdoor experience on our camping pitches or prefer the cosy comfort of our mobile homes, chalets and flats, we will do our best to meet your expectations. Our camping pitches are spacious, demarcated, shady and have power hook-ups for your tent, caravan or camper van. Our mobile homes sleep two to eight people, with all mod cons, and are perfect for enjoying a magnificent view of the mountains. We also offer a range of flats for a more luxury stay with all the comforts you could desire. We do everything in our power to ensure your outdoor holidays are unforgettable, with 4-star amenities suited to your budget. Our water complex covers an area of 600 m2 and is the real heart of Camping L’Idéal. During your holidays in Annecy, you can take advantage of our pools to cool down and sunbathe peacefully on one of our sun loungers. Whatever the season, you will have the pleasure of swimming in our heated covered pool with a retractable roof. Your children will marvel at the sight of our twisting waterslide and our five lane racing slide. The campsite’s water park also includes paddling pools for your tiniest tots, who can play safely in a fun area designed to meet their needs, a relaxation area for parents, an infinity swimming pool and two solariums. 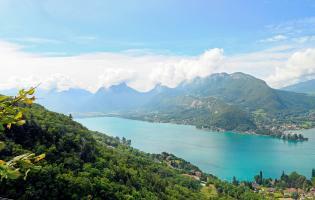 A holiday at Camping L’Idéal in Annecy is an opportunity for a lively stay with a wide range of activities on offer. At your disposal are a mini-club, a sports ground, a bowling green, two tennis courts, ping-pong tables, a fitness centre, a crazy golf course, a video game room and play areas. Not to mention a sociable programme of activities suited to the whole family which our trilingual staff look forward to concocting for you, from mid-June to the end of August. When evening comes, the atmosphere at the campground is calmer and more relaxed, but it is simply out of the question to stop when we’re having so much fun. Between magic, shows, concerts, theme night, bingo, fireworks and more, you are sure to have an unforgettable time! In terms of amenities, you will be won over by our 4-star services which will put the finishing touches on your holiday. Whether for your breakfast by the pool, lunch, a drink on the terrace or for your dinner, you will appreciate our restaurant/bar and our delicious, typical Savoyard cuisine. Reception is open daily, and our hostesses will be happy to greet and advise you during the high season. 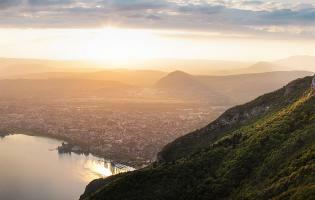 In winter, we can be reached by telephone or via the contact form, to help you plan your trip to Annecy. You will also find many other amenities on site, like WiFi, shared barbecue grills, a laundry, the possibility of hiring bicycles, refrigerators, sheets and towels, and the list goes on. 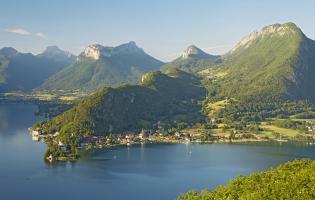 In short, everything you need to a comfortable holiday on the shores of Lake Annecy. A land of contrasts boasting idyllic scenery, the region around Lake Annecy offers endless options for your leisure and activities. Nautical and water sports on the lake, plus aerial and high mountain sports are available in summertime, with snow and ice sports in the winter: at our campsite, each season holds its share of delights! The lakeshore is dotted with marinas, developed beaches, walking paths, cycling trails and architectural treasures. The closest pistes are just 30 minutes from Annecy and the campsite, and the area’s winding roads are ideal for a fabulous motorcycle ride. Hiking, rock climbing, cross-country and downhill skiing, mountain biking and canyoning are enjoyed as frequently as diving, paddleboarding, pedalos, kitesurfing and hang gliding. Leisure and activities for both families with small children and thrill-seeking holidaymakers! Please contact the campsite’s reception team for any questions about these activities (prices, descriptions, etc.). With its incredible scenery as far as the eye can see, the Haute-Savoie is a true paradise for lovers of open spaces. This land blessed by nature is dotted with monasteries, châteaux and museums that will thrill history and culture enthusiasts. During your camping stay in Haute-Savoie, you will enjoy exploring the famous ski resorts of the Alps like La Clusaz, as well as the charming villages and towns of the Savoy, such as Doussard, Duingt, Veyrier-du-Lac, Talloires-Montmin, Sévrier, Saint-Jorioz, Albertville and Menthon-Saint-Bernard, to name but a few.